Our most recent trial was against, once again, Allstate Insurance. While this may not have been our biggest trial, it is just as important. 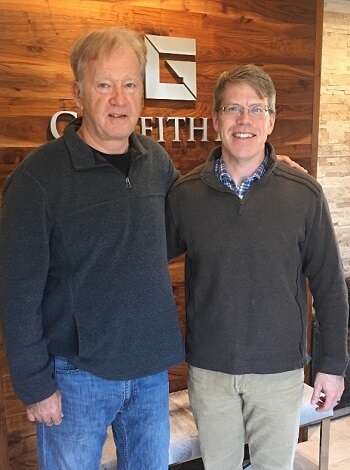 Our client, Mr. Mark Glessner, was left with a decision as to whether to take a paltry offer, or risk his case at trial before a Sumner County Jury. Mark was hit in an intersection that did moderate damage to his car. Allstate offered $38,000 initially, stating it was a lot for a “soft tissue whiplash injury in conservative Sumner County.” Well, the good folks in conservative Sumner County who sat on this jury disagreed, and provided a verdict of $102,276.09. We won this case because Mark Glessner was honest and deserving of this verdict. I was proud to sit by him and represent him. He was nervous and scared of what the jury might do. It was a risk. I asked him to bare his soul, and to trust the jury. He did. And they did. Insurance companies continually say juries will never allow 6 figures for a soft tissue case. When I attend mediations with my clients, mediators try and tell me that juries will never give 6 figures on soft tissue “whiplash” cases. I bring along our clients’ verdict forms and tell them they are wrong. If you are legitimately hurting, honest, and doing everything you can to get better, jurors will do the right thing. It is a great feeling walking out of a courtroom after dealing with these snotty arrogant adjusters who have tried to tell me for over a year or 2, via their lawyers, that my client’s case is worth peanuts. I will continue to fight for my people. Thank you for allowing me to work for you. It is an honor and a privilege. 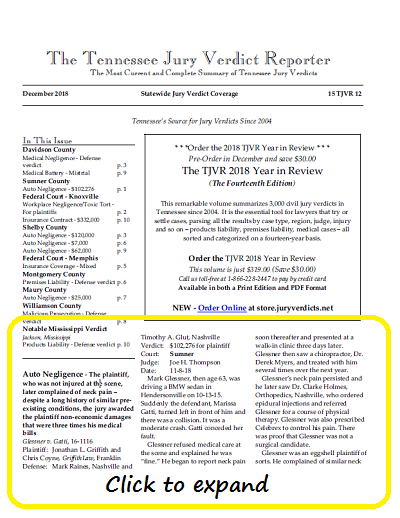 Glessner v. Gatti, 16-1116 was featured in The Tennessee Jury Verdict Reporter. Click below to read the full write up of Mark Glessner's case.